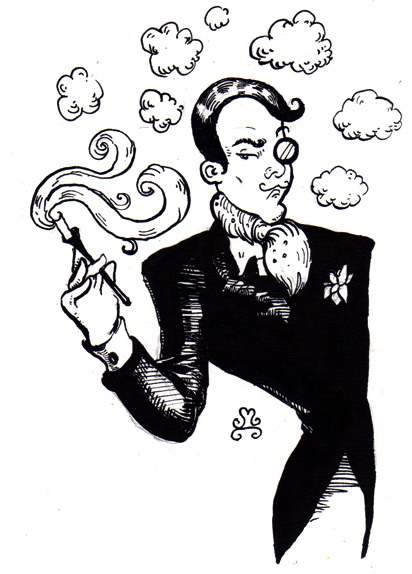 Frozen… Ma Griffe by Carven The Perfumed Dandy’s Scented Letter | The Perfumed Dandy. That first thaw was nothing but a false promise of Spring. A few days of green, smelling almost chemically fresh after a winter’s absence, and then the ice re-descended. In heavy boots she makes her way across frosted grass its bright coloured hope still visible through translucent water now made glass. Through dawn’s shivering shimmering light she sees a foolhardy wild lawn, bleached mosses, snowdrops, the odd unfortunate purple crocus, miniature iris pushing up against a cold ceiling. Beneath the frozen pane white primulas pretend being gardenia, their pastel cousins ape tulips. And though they are already deceased and just deep freeze preservatives of their former selves, she minds her step, careful not to carelessly crush scarce beauty. At the lake’s edge its solid expanse deceives with a pledge of permanence. She knows a few weeks hence and it will be ebbs and flows, freeform and fluid again. ‘Ice Woman’, ‘Snow Queen’, ‘Bird Lady’. The children who come, some affectionate, some angry, some reigned in and some indulged , they know her by many names. All except the one she keeps for herself. For with her metal spade, it’s trusted still true blade, two thermos flasks of hot water and steely will she will recover one portion of the lake. In her corner, the season changes for an hour or as long as she cares to make it linger. At first sight of a rippling surface bewildered birds swarm and then swoop to slake parched palettes and bathe. Brave sharp toothed mammals kitted out in winter furs and woken too soon from an hibernating slumber saunter sleepily forth eager for refreshment. All, suddenly, is life again. ‘We are continents you and I’ he said ‘Our plate tectonic wills erupt when they collide’. She puts that irrevocable breach to one side and concentrates on her small foreshadowing of the inevitable coming of warm weather. 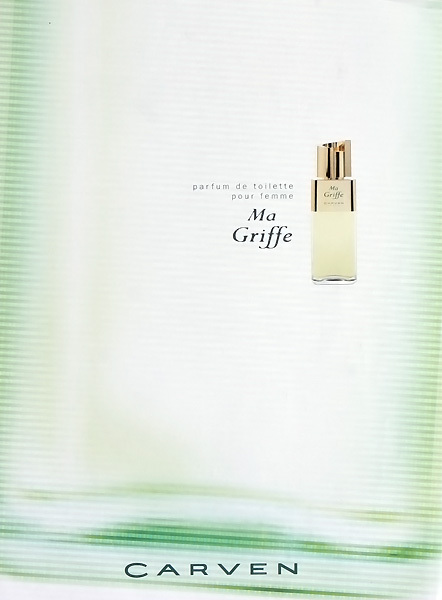 Ma Griffe is a sorrowfully optimistic scent. It seems to know that despite its pure white floral heart it is destined to lead a cold life. It makes a fair fist of a bright opening all aledhyde and aromatic, then transforms effortlessly into a clean and becoming bouquet of freeze dried flowers. Though somehow these notes of gardenia, iris, orange blossom, jasmine, muguet and rose are too brittle. One senses they would break if touched. It is this fragility, as if the whole fragrance’s slight composition where stretched out to too tight over an oakmoss structure too big and forceful for it, that is the scent’s haunting charm. If it were not for a slight powdery sweetness that arrives midway through, this perfume would be the very epitome of sparseness. As it is Ma Griffe is entirely sympathetic and strangely attractive in a solitary way. It should be noted that loneliness afflicts both men and women equally, this being the appropriate accompaniment for such an unfortunate emotion I see no reason why all should not feel free to use it. Oh, my goodness, what a beautiful review. I can sense the warmth beneath the hoarfrost, the tiny desire to break cold green shoots through a wall of icy chill. I must revisit this perfume now! I sincerely hope you do, but be careful it is a porcelain doll sort of a scent and must be handled carefully if its whole beauty is to be retained. I have never tried Ma Griffe but now I must have an Ice Queen in my palace! Beauty knows no pain and this review is surely a testament to that. Loved It! I am absolutely amazed. I love this scent. It’s one of the only classically ‘feminine’ scents I wear freely and enjoy more than almost any fragrance I own : masculine or feminine. Thank you for making it even more beautiful and meaningful to me. The way you express how this fragrance can be appreciated equally by a woman or a man is clean poetry. That link to loneliness was beautiful. Just like the gift of the created scent – inspired by the appreciation of love, art, life and the memory of scent, as you know Jean Carles created this fragrance after he had lost his ability to smell … the story – for me – takes the understanding of that type of intimate memory and gives it the hope of new life if only through a well preserved bygone yet still vivid memory. Although I have contemplated this scent on occasion and wondered what Carles might have thought it smelled like, until now I never imagined that it might have been an artistic representation of yearning, in Carles case to smell again, to love again – for him scent and love were interchangeable words – his yearning – after all there can be no loneliness without yearning – to smell what he had so beautifully embraced and loved and knew so intimately in his youth. I think that might be why the composition is so ‘fragile’ as in your description. So fleeting yet grounded in reality. This scent has amazed me for some time, more so after learning about the artist who created it, but this story and description take me further into it’s magic. All I can add to that is : Thank you. I am forever indebted to you for such a wonderful and perceptive note. I hope therefore always to tread gently. Your comments on yearning need no addition from me, other than to say that Jean Carles was in my mind, as was the inevitable isolation that the loss of any sense or any sensual intimacy brings. Like islands separated from the continents to which they once belonged. What a lovely post! I’ll be thinking about it today. Your recommendation is gratefully received and noted for future reading. I fear for Ma Griffe in hotter climes, she is unused to travel and high temperatures. Speaking as a lady whose thermostat is set a little high these days Ma Griffe will now be my “go to” scent for cooling enchantment. I’m wearing Ma Griffe this morning while re-reading your review, Mr. Dandy, and Imsookool’s sensitive, insightful post. What wonderful posts! How interesting that this was composed when Mr. Carle lost his sense of smell. Ma Griffe is sweet on my skin, and gentle, fleeting yet defined. I agree that it is somewhat sorrowful, maybe a good fragrance for people who “vant to be left alone”. Mine is a vintage pdt. I don’t like the current version. Hmm……I really must go sniff this classic. I adore all the fresh, crunchy, icy descriptives. It is a favourite of The Dandy’s at this time of year. For me it acts almost counter intuitively to warm one up in the cold – like hot tea cooling one down in the summer. Wow. I had never thought of Ma Griffe in such terms: I shall see it anew. Thank you so much for a most generous compliment. New reviews return tomorrow. But on this feast of the Epiphany the return of a wise but solitary woman. With thought for all of you under ice in America and being blown away be winds in Britain. This was a lovely review of Ma Griffe which is one of my favorites vintage parfums. Beautiful, evocative writing Mr Dandy. I have a bottle of Ma Griffe parfum inherited from my gran which from research, dates circa early 50s. It’s not one of my favorites, as the Chypre family often doesn’t play well with my skin, but I totally agree with your assessment and analogy. It is a remarkable Chypre – bitter, strong, green out of the gate, with that slightly disturbing (to me) rotting note of the asafetida. I can certainly see how it can be described as sorrowful but with a hint of cautious optimism. As a person who tends to melancholia – especially at this time of year – but is very aware of the lightening of the days and the life beneath the ice, I will revisit this gem and see how I find it with your review in mind.